This comes from when I added an example called "Choosing a Java IDE" to the documentation topic Java Overview. So according to the history, my example got upvoted, giving me 5 reputation, then removed randomly with no notification or reason, for which somehow I lost 45 reputation by losing 5 reputation 9 times simultaneously, after which I gained another 2 reputation for making a change to the same topic, of which I did no such thing. I'm baffled. What's going on? Was this an accident or part of the update or did I do something wrong. If I did, please let me know what I did wrong so this does not happen in the future. In fact here's a pastebin of the example. There is no possibility of this being from the recent update involving "minor contributors", because this was before then and I am the creator of the example, is I would lose 4 reputation 3 times since it had 3 upvotes at the time. And that would be IF I was a minor contributor, which I'm not. Also, if I were to put the example back again for approval, and it were to be approved, would I be randomly punished like this again? Which echos the responses the three people who flaged the example. As animuson ♦ states the 45 rep loss was correct. You did gain 45 rep from that topic so when it was deleted you loss the 45 rep. He is not sure why it says 3 in the history but hopefully this figure it out. As far as the 2 rep you got you actually did do something to earn it. 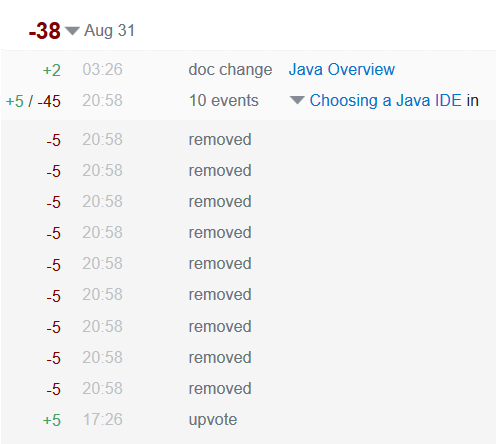 Back on August 31st you submitted an improvement request for Java Overview and it was handled. Since it was approved you gain 2 rep for that. Not the answer you're looking for? Browse other questions tagged support documentation reputation reputation-history .